Almost everywhere you looked last weekend, it was deju vu with Premier League managers making five, six, seven – often even 10 – changes to their regular line-ups. And look what happened – giant killings galore, reputations shattered. None more so than Liverpool who gambled on an inexperienced, unfamiliar line-up and were dumped out by Wolverhampton Wanderers of the Championship, their last bid for cup silverware ingloriously dashed in front of their own highly demanding fans. You’d have thought Liverpool manager Jurgen Klopp, having lost in two finals last season, might have got the message and taken matters more seriously. Of course he apologised afterwards but it was too late. Liverpool made nine changes, handed starts to four youth products and paid the ultimate price. All over the country the same scenario was being repeated in fourth-round action: Leeds United, one the most iconic names in English football, humiliated by a part-time team, Sutton United, who play in the National League, the fifth tier of English football one rung below the professional pyramid. Another high-flying Championship club, Brighton and Hove Albion, similarly embarrassed by non-league adversaries, Lincoln. Add to that list Watford, Hull City and Newcastle – all beaten by lower-league opposition after making a slew of changes while only two last-gasp goals right at the death prevented Tottenham Hotspur, for whom the FA cup has historically been a huge deal, becoming the weekend’s biggest giant killing scalp of all as fourth-tier Wycombe Wanderers came agonisingly close to pulling off a stunning upset. Tottenham manager Mauricio Pochettino, for all his undoubted attributes and qualities, has one Achilles heel. The same one he had at his previous club Southampton and the same one that can be levelled at so many top-flight Premier League coaches: refusing to care sufficiently about the world’s most iconic knockout competition. Some might argue that the weekend’s results prove the romance of the FA Cup is still very much alive and kicking. It is the first time in 90 years, for instance, that two non-league clubs have progressed to the last 16. But that’s not the point. The 13 Premier League clubs in fourth round action made 98 changes to their line-ups, an average of 7.5 per team. The result is that only eight Premier League sides will be in the draw for the last-16. And one of those, Leicester City, are facing a replay first. Let’s face it, there are only four competitions you can win – three if you are not in Europe. On Twitter, another former England striker Gary Lineker, who presents Britain’s long-established Match of the Day highlights programme, said Liverpool boss Klopp had showed a “lack of knowledge of the depth in English football and respect”. The fact is that rotation has been taken to ridiculous extremes. As I wrote a year ago, the buzz of a cup run alone can have a galvanising effect. It is a massive error of judgement to think otherwise and downplay the tournament’s relevance. I have nothing against coaches making changes to prevent burnout and injury and give fringe players a chance. But why not also make them in the occasional league game? The league, after all, goes on for the best part of nine months. The cup takes six games to win. The counter-argument is that those clubs chasing a top-four spot should prioritise achieving Champions League football. Fine but as I say, not always at the exclusion of the FA Cup. By the same token, those with stretched resources trying to avoid relegation need to take precautions. I understand that but why not try and build confidence with a cup run? More justifiably perhaps, clubs like Brighton, Newcastle and Leeds can be partially forgiven for prioritising trying to return to the Holy Grail from the Championship, a feat that is becoming increasingly difficult. It all comes down to strength in depth. Only if your squad is packed with international players (Arsenal, Chelsea, Manchester City and Manchester United) can you risk fielding virtual second-string teams against supposedly weaker opposition. Klopp should have realised that before it was too late while Pochettino just got away with it. The biggest culprits of all, however, are those who have nothing to lose by fielding full-strength squads yet still “rest” most regulars: teams in the middle of the league who are safe from the drop yet are unlikely to pick up sufficient points to qualify for Europe. For them, what on earth is the logic of making so many changes instead of having a right go? Bournemouth are a case in point having senselessly made 11 changes in the previous round, only to be knocked out by Millwall, a team two divisions lower. Millwall’s latest scalp were Watford who clearly hadn’t learned from Bournemouth’s experience as they, too, were humbled by the same hungry opponents. And what about Southampton? 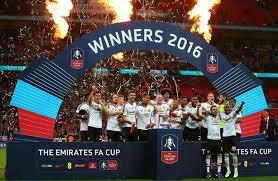 Already in the final of the League Cup, a huge achievement, they wrecklessly threw away any chance of further progress in the vastly more prestigious FA Cup. Up against an Arsenal side who were bound to make a raft of changes because of strength in depth and top-four aspirations, Southampton decided to do likewise. Even though their resources are far slimmer. Even though they have nothing to worry about in the league . The result? A 5-0 demolition. Totally baffling. I have a solution to all this, one which has been knocking around for ages but which nevertheless has considerable merit and will put the FA Cup back where it belongs. Take a Champions league spot away from fourth spot and give it to the FA Cup winners. In other words, the top three – a real reflection of season-long consistency – plus the FA Cup. Gold, silver and bronze plus the FA Cup. I am realistic enough to admit that this may never happen. Money talks and there are too many vested interests. I also completely take on board that it’s a squad game these days. But the bottom line, as pointed out earlier, is that there are only a handful of prizes most clubs have a chance of winning. It’s time managers (and one suspects boards of directors) got back to grasping that the FA Cup still matters, not only to the minnows but to the elite too. And for those fans who are of a younger generation than me and who disagree profoundly, let me leave you with this. What carries more weight in a team’s history? Winning the FA Cup or finishing fourth, squeezing into Europe’s elite competition and then invariably getting eliminated? What do fans remember most? Football is surely meant to be about trophies and titles, whatever age we are in.